Culms: Erect, stout, unbranched, round in cross-section, without nodes. Leaves: Alternate, erect, long-linear, moderately exceed inflorescence, .5 to 1 inch wide, bluish-green to grayish-green, glabrous, flat on back; sheath closed, continuous with blade. Inflorescences: Spike, cylindrical, erect, terminal, monoecious; staminate portion above, 3 to 5 inches long, contiguous with pistillate portion; pistillate portion resembles cigar, 4 to 6 inches long, .6 to 1.5 inches thick, green when young, turning brown. Flowers: Numerous, minute, packed densely together; perianth lacking; staminate flowers consist of single stamen, drop soon after shedding pollen; pistillate flowers lacking bracts, green when young, turning brown; pistil single, on stalk bearing numerous long, downy hairs; stigmas broadly ovate to lanceolate. Fruits: Achene, spindle-shaped, numerous downy hairs at base; seeds nut-like, dispersed by wind. Habitat: Marshes, wetlands, pond edges, ditches, and along streams; non-saline soils. Uses: Parts of this plant were extensively used by Native Americans. The roots were used as a food source, in a poultice to dress wounds, and in treatments of kidney stones. The down was used to stuff bedding and as a burn dressing. The pollen was made into flour. The leaves and stalks were used to make mats and baskets and served as a roofing material. Comments: Cat-tails are sometimes considered weeds due to their aggressive growth. They are rhizomatous and will form dense colonies. 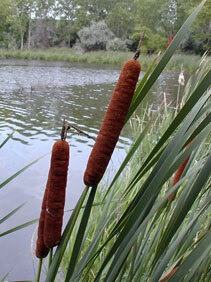 Cat-tails provide wildlife cover. See also narrow-leaf cat-tail Typha angustifolia.